There are multiple claims to the world's biggest ball of twine record in the United States. 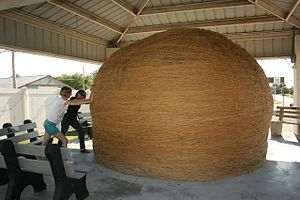 As of 2014, the ball of twine with the largest circumference is located in Cawker City, Kansas. In Cawker City, Kansas, Frank Stoeber created a ball that had 1.6 million feet (490,000 m) of twine and 11-foot-diameter (3.4 m) when he died in 1974. Cawker City built an open-air gazebo over Stoeber's ball where every August a "Twine-a-thon" is held and more twine is added to the ball. By 2006, the twine ball had reached 17,886 pounds (8,111 kg, 8.9 US tons), a circumference of 40 feet (12 m), and a length of 7,801,766 feet (2,377.978 km; 1,477.6072 mi). In 2013, its weight was estimated at 19,973 pounds. In August 2014, the ball measures 41.42 feet (12.62 m) in circumference, 8.06 feet (2.46 m) in diameter and 10.83 feet (3.30 m) in height, and is still growing. Darwin, Minnesota, is the home of a ball of baler twine rolled by Francis A. Johnson. It is 12 feet (3.7 m) in diameter and weighs 17,400 pounds (7,900 kg; 8.7 short tons). Johnson began rolling the twine in March 1950, and wrapped four hours every day for 29 years. 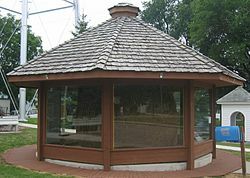 It is currently housed in an enclosed gazebo across from the town park on Main Street at (45°05′47″N 94°24′37″W﻿ / ﻿45.096332°N 94.410276°W﻿ / 45.096332; -94.410276) to prevent the public from touching it. The town celebrates "Twine Ball Day" on the second Saturday in August every year. An adjacent volunteer-run, free to visit museum and gift shop has information on the history of the ball, as well as selling a variety of souvenirs. It was the long-standing holder of the "biggest ball of twine" title in the Guinness Book of World Records, holding the title from its completion in 1979 until 1994, and was referenced by "Weird Al" Yankovic in his 1989 song "The Biggest Ball of Twine in Minnesota." In Lake Nebagamon, Wisconsin, James Frank Kotera claims to have made the heaviest ball of twine ever built. He started it in 1979 and is still working. Kotera estimates, by measuring the weight of each bag of twine that he winds on, that the ball weighs 8,770 kg (19,336 pounds), making it the heaviest ball of twine ever built. The ball is housed in an open-air enclosure in Kotera's lawn. The ball has a smaller companion, "Junior", that is made of string. In Branson, Missouri, a ball of nylon twine built by J. C. Payne of Valley View, Texas, is on display in Ripley's Believe It or Not museum. The ball, which measures 41.5 feet (12.6 m) in circumference, was certified as the world's largest ball of twine by the Guinness Book of World Records in 1993. It is, however, the lightest of the four contenders, weighing 12,000 pounds. "Weird Al" Yankovic's album UHF - Original Motion Picture Soundtrack and Other Stuff has a song called "The Biggest Ball of Twine in Minnesota". Although ostensibly about the ball in Darwin, Minnesota, Yankovic takes artistic license with the statistics. In a case of life imitating art, postcards that read "Greetings from the Twine Ball, wish you were here," a fictitious invention of Yankovic's, are now an attraction in Darwin. The Twineball Inn was a restaurant (not a motel) that has since closed. Yankovic refers to the ball itself, and thus his previous work, in the video for "White & Nerdy", wherein a Trivial Pursuit card which includes the question "In what city is the largest ball of twine built by one man?" appears on screen. Sam: It's things like this that make me wish I were Canadian. Docent: They've got one of these too, but half of it's French. In one episode of Time Squad, George W. Bush tries to lift the spirits of Americans by building the biggest ball of twine. The Cawker City, Kansas ball of twine was the subject of Garry Trudeau's comic strip, Doonesbury, on July 16, 2012. In the 2001 Canadian film, Jet Boy, one of the characters drives a car into what is billed as the world's largest ball of string to test whether or not the structure is hollow. In the 1996 movie Michael, starring John Travolta as an angel on holiday on Earth, his character requests to stop and visit the biggest ball of twine that was supposedly located somewhere in Iowa. In the 1983 movie National Lampoon's Vacation, Clark Griswold (Chevy Chase) tries to entice his reluctant kids back into the family station wagon with a promise to take them to see "the second-largest ball of twine on the face of the earth, which is only four short hours away." In the 1943 story The Mystery Yarn, part of Robert McCloskey's children's book Homer Price, two male rivals for a lady's affection, both of whom have string balls that are nearly six feet in diameter, stage a public contest to unravel the balls; they agree among themselves that the loser will be required to desist as a rival; however, the lady outsmarts their plan. ^ The Battle to Be the World's Largest Ball of Twine; The Atlantic Magazine, September 2014. ^ "World's Largest Ball of Twine". RoadsideAmerica.com. Retrieved January 27, 2013. ^ a b c Charles Murphy (1993-12-28). "Balls of String". ABC Evening News. Vanderbilt Television News Archive. ^ Cawker City wins the ball game with massive sphere of twine; The Wichita Eagle; September 28, 2014. ^ a b Twisted: The Battle to Be the World's Largest Ball of Twine; The Atlantic; September 9, 2014. ^ Doug Kirby; Ken Smith & Mike Wilkins. "World's Largest Twine balls". RoadsideAmerica.com. Retrieved January 27, 2013. ^ "Darwin's Twine Ball Museum". Dassel-Cotako Enterprise Dispatch. Archived from the original on January 7, 2013. Retrieved January 27, 2013. ^ a b "Eye To Eye: On The Road Again". CBS. 2008-11-12. ^ "JFK's Twine Ball: World's Largest?". RoadsideAmerica.com. Retrieved January 27, 2013. ^ (subscription required) "Texans have a ball, but unraveled twine king unimpressed". San Antonio Express. December 4, 1993. ^ "World's Largest Ball of Twine, Branson, Missouri". RoadsideAmerica.com. Retrieved January 27, 2013. ^ Trudeau, Garry. Doonesbury. July 16, 2012. Retrieved January 27, 2013. ^ National Lampoon's Vacation (IMDB). Retrieved January 27, 2016. Wikimedia Commons has media related to sisal and twine. This page was last edited on 16 November 2018, at 11:06 (UTC).